Why is the downtown Publix really a game-changer? The term “game-changer” has been batted about metro Birmingham a lot in recent days as news of a planned mixed-use development anchored by a Publix grocery store on the city’s Southside spread like wild fire. For those who haven’t heard yet, an article in the May 18 edition of The Birmingham News revealed the Lakeland, FL-based grocer as the main tenant of a $30 million development proposed to sit on the northwest corner of 20th Street and 3rd Avenue South. Now, I’ve lived in the greater downtown area since 2004, and I’ve always had as few as four and as many as six major options available to choose from within 2 miles, but I had to drive to them. When people ask me “Where and how do you get groceries?” I admit I’ve long ago started replying by asking them, “Well, where and how do you get yours?” I get a stunned look, but most times they seem to get what I’m saying. That said, it’s not an option readily or easily available to a significant number of our city’s residents. It’s more about WALKING now than DRIVING. Yes, there’s a parking deck that will sit between the ground floor space and the 36 “loft-style” apartments planned for the top the building. The vehicles using these spaces though will be off-street and out of sight. The idea of needing to circle forever to find a spot or the installation of a surface parking lot to handle capacity doesn’t even come up in conversation – and that’s a great thing. It suggests developers realize there will be enough people within walking distance to support its operation. It takes away reliance on an automobile to make a development like this one work. It means it should be easier to get other national and regional retailers to consider locating a business downtown. It also makes it easier to get those same retailers to start looking at options in neighborhoods throughout the city. It could potentially make the issue of placing parking immediately adjacent to their business less of a sticking point. Dare it be suggested it could also be the first step toward a re-write of the city’s parking regulations and a rethinking of its minimum requirements? It was weird, as most New Yorkers refer to pretty much all of Manhattan as “downtown” no matter which of the other four boroughs you live. I’d also moved here after working for an agency charged with the revitalization of “greater Downtown” Savannah, not just its famous historic district. As a result, I’ve long considered the areas surrounding the city center part of greater downtown Birmingham. It makes sense especially when you get a chance to see just how small the expanded area still is in relation to the rest of the city. The announcement of this grocery store lends itself to a new approach involving population growth in the urban core focused on eventually seeing people choosing to live in the single-family home dense portions of Druid Hills, Fountain Heights, and Norwood (in addition to others like Titusville, Smithfield, and College Hills) after spending a couple of years living in an apartment located nearby in the city center. Every major news outlet in the city referred to the project’s location area as downtown, suggesting the shift in perspective (one long championed by REV Birmingham and its predecessors) is finally starting to happen. The change in perspective also means a realization about the choices available to someone thinking about their next move. Pardon the formality, but the folks at Mt. St. Michael Academy in the Bronx would be upset with me if I didn’t maintain it to a certain degree while writing this note. The previous sentence would suggest correctly that I’m a native of New York City, one who can claim to have grown up watching your forecasts on WNBC-TV until heading off to college in Georgia in 1993. I’ve been a fan for a long time and have appreciated the frankness over the years (I’m specifically thinking about our freak snow storm in early March 1993). I’m writing not to question your comments about the recent handling of the winter storm in Atlanta – that seems fairly spot on given the information at hand – but to question the generalizations made during the start of the 9 a.m. ET hour of Today on January 30 that while probably not intended, lumped many Southern cities together in a broad characterization of the situation. I’m particularly interested on how those comments reflect on what happened in Alabama, where I’ve lived since late 2004. I only wish I could link to a video of the segment in question – it only seems fair. I’ll just write from the heart though and see how it goes. The image to your left is representative of the graphics used by many media outlets in north central Alabama on Monday evening. As you can see, Birmingham and the majority of its surrounding area was only forecast to see a “dusting” of snow. The area that was predicted to receive the brunt of the storm was the southern portion of the state (mostly areas south of Demopolis), one that received a state of emergency declaration by Gov. Bentley earlier Monday. Most of the resources needed to tackle what would normally be a minor mess were sitting well to the south of the state’s largest city – the area that was eventually most affected. It was an area that was still expecting less than an inch as late as the 5:35 a.m. graphiccast post made to the NWS Birmingham’s page on Facebook. The interview CBS affiliate’s Mark Prater did this morning on The Matt Murphy program. Considering the circumstances, it went about as well as could be expected. Those parts of the state originally scheduled to receive snow were able to cope with the change in forecast, most notably Mobile. Those areas up here responded admirably considering the circumstances, demonstrating what Birmingham News columnist John Archibald properly described a chance to “marvel at the human spirit.” It’s something still on display today as we await the thaw. Perhaps we’ll figure out a way to do staggered releases from school and work in the future. Maybe the opportunity to look at how sprawl played a role in the large numbers of cars stranded on interstates and highways will be taken advantage of as we recover. I live in the southeastern United States, but I specifically live in the state of Alabama. It handled it as well as it could. I saw on your Twitter timeline that you like it when articulate points are presented. I only hope you’d consider this one as we continue through what’s already been a crazy winter across the country – the need to measure the use of words carefully and not to lump folks without recognizing the weight that comment may carry. I’d just say Georgia, and not “the South,” but that’s just me. Anyway, have a safe trip to the Olympics, and thanks for taking my comments into consideration. André Natta started The Terminal in 2007. I recently stumbled across an online discussion that included what turned out to be an issue of semantics. It hinged on the understanding of the words believe and care. We who believe in the future of Birmingham must also be able to show what we’re able to do to support that belief. That’s the difference between believing and caring. I’d argue you can only believe or not believe; there’s not much grey area. There are, however, many ways to show how much you care about someone, or in Birmingham’s case, something. You’re basically demonstrating the extent of your belief – something I’d argue is desperately needed locally as we prepare to move forward. I care enough to write about my beliefs and dreams for the future of Birmingham here and elsewhere. There are others who leverage the power of critical mass via petitions and online forums to demonstrate concern about issues they believe affect the future of the city. A few brave souls have decided to throw their hats into the proverbial political ring hoping they can show residents and school children just how much they believe in the city by not caring about the messiness that comes with municipal campaigns in Alabama’s largest city. Still others choose to cheer on every positive development in the metro area while willingly doing verbal and digital battles with those not as eager to admit changes are coming. Sometimes when local businesses show how much they care about a new effort underway, you can even give someone reasons to believe in Birmingham all over again. It’s important as this cultural revolution continues to evolve in Jones Valley to point out that how you choose to show you care shouldn’t matter as much as the fact that you do. It’s tough to show concern for (and possibly tougher to disagree with the common opinion about) something you don’t have a strong opinion. It’s nice to also remember that if everyone went about doing the same thing, life (and this city) would get pretty boring – quickly. You have to believe in Birmingham before you can truly care about its future. Luckily, it ends up becoming a viciously grateful and encouraging circle of action – thank goodness for that! 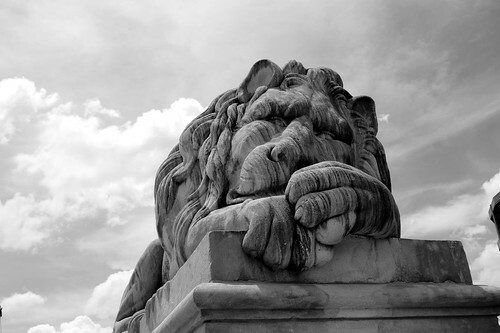 Photo: Legion Field Lion/ lensman20/Flickr. NOTE: This is an annotated and edited version of a piece published in the current (April 2013) issue of B-Metro Magazine. One of the unexpected results of watching the city as it reacts to increased media coverage during the commemoration of the events of 1963 is how it tends to look at itself. I spent 11 years of my life in Savannah, GA, including most of the quirky “Midnight in the Garden of Good and Evil” era. I find myself shaking my head wondering what would have happened if Facebook, Google+, and Twitter existed back in 1994 and what a difference it would have made in the development of that city and its culture. I’m getting to watch a similar era unfold in Birmingham, as we bask in recognition of our food and music scenes while piles of dirt are moved throughout the region showing signs of progress and growth. It’s fun to guess whether or not the person writing the article about our being a top vacation getaway or an up and coming city has actually ventured into Jones Valley. Recent months have seen us recognized by several media outlets — via the web, print, and television — for various innovations and accolades. It’s been easy to point to any of these pieces as proof of progress when someone talks about how there’s nothing going on in the city. It’s also a welcome way to surprise locals and long–time residents alike when they learn how some outsiders view their fair city – positively. Nothing fights pessimism better than a good long look in a mirror being held up by someone who is removed from the situation. It’s a funny world when you look at social media being treated and observed as “so me” (a useful abbreviation) and personally focused. It’s a requirement of sorts since it’s basically your journey through life as you engage those who have chosen to follow you via one or several of your digital profiles online. It is a window into who you are and what makes you tick. It can be molded by you to convey whatever you think is appropriate. It does make it tough to know what’s going on nearby, or even across the room. Perhaps that’s why I enjoy those moments when we use it as more of a mirror to empower and engage a community to do better. Today Birmingham serves as a shining example of that approach towards social media, courtesy of the Birmingham Public Library. Universities, high schools, performance venues and cities across the country and around the world have already signed up and pledged to read an important document in the civil rights movement — Martin Luther King Jr.’s Letter from Birmingham Jail. 2013 is as much about the need for Birmingham to tackle this conversation internally as it is to remind the world it still needs to happen. It’s an opportunity for the community to use these digital tools not just as a way to shine the light on itself, but as a tool to hold a mirror up to society to remind them we’ve got a lot more to tackle as humanity’s march continues. It’s a chance to paint a picture of the city’s future by embracing what’s happening now and questioning those things seen as messy and clunky. Perhaps it’s fitting to think that “if not for Birmingham,” — and our digital present — we wouldn’t have this chance to continue to shape the future, for us and our fellow man. Just think — we’ve still got just over seven more months to go, too. There are a lot of people looking to tomorrow, 12/12/12, as a day of significance. It could be a day that marks a new chapter and an evolutionary leap for a community. I’d argue a decision of that significance for the future of Birmingham was made late Tuesday morning when the Birmingham City Council reconsidered agenda item 34 at the end of their meeting. That’s when they decided to unanimously approve the sale of Lot D, the site used as the muse for the Community Foundation of Greater Birmingham‘s Prize 2 The Future idea competition last year, to Alabama Power for $2.95 million– based on a recommendation from the city’s Budget and Finance committee. The redevelopment project that has been hinted at when talking about this purchase could include a conversion of the soon-to-be dormant steam plant currently operated across the street by the utility. Many would find it hard to not agree the property’s location is not ideal or pivotal to the current level of activity underway south of the railroad tracks. Despite years of some disliking when Southside was referred to as downtown, it may become an essential part of its genetic makeup fairly soon. Those who remember the residential development known as The Standard originally slated to go across from Railroad Park at 18th St. well before the urban oasis was completed may notice soil is being moved, perhaps suggesting it may yet move forward, in some form, soon. Keep in mind that Rev Birmingham (formerly ONB/MSB) has promised upcoming announcements about two residential projects close to the park in their recent newsletter. 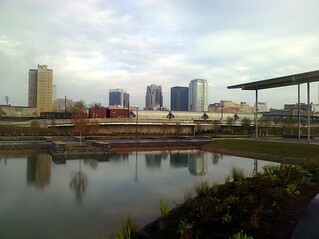 It got me wondering about what kind of project could be capable of continuing the transform the City of Birmingham. I started thinking about the areas surrounding the parks that Railroad Park are often compared with and found a common theme – one that could lead to a proposal as transformative as the ones considered during last year’s idea competition. While folks like to compare Railroad Park to New York City’s Central Park, there are many native New Yorkers who’d find Bryant Park a better comparison and one that leads to far more potential. The park acts and looks like more of a living room than most, allowing for an outdoor reading room, movie screenings, fashion shows. The first use included in that list is made possible in part because of the park’s next door neighbor, the main branch of The New York Public Library. A similar situation is found at Chicago’s Millennium Park, as its eastern edge is defined by The Art Institute of Chicago. There are other examples of civic cultural institutions anchoring gathering spaces throughout the country. This is why seeing two people who were in attendance at today’s meeting made me think of a crazy idea for Alabama Power’s rumored project – Kate Nielsen, the Community Foundation’s executive director, and Gail Andrews, the director for the Birmingham Museum of Art. Ms. Nielsen spoke in support of the sale of the property at Monday’s committee meeting, with the Foundation posting a supportive statement on its site yesterday afternoon. Ms. Andrews enjoys overseeing the largest municipal museum of art in the Southeast, though at times at least 60% of the collection is not available for viewing. An expanded home or an opportunity to establish a second location (similar to what the Guggenheim Museum was able to do in New York years ago), would be extremely beneficial, especially as the eyes of the world turn to Birmingham in the coming months.